The hotel features 604 beautifully remodeled rooms with voice mail, pay-per-view movies and a choice of city or mountain views. 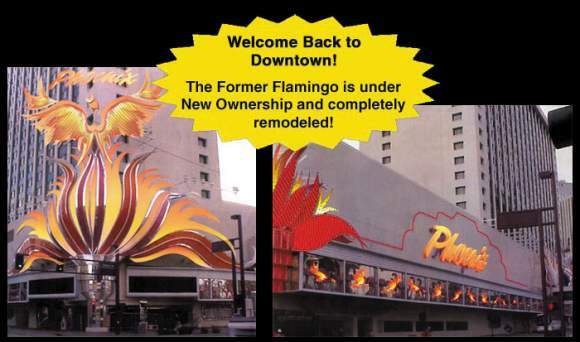 The Golden Phoenix-Reno Hotel, formally the Flamingo Reno, has everything you're looking for, including a complimentary airport shuttle service, free valet parking and convenient spacious self parking. The Casino will be opening late summer. This location offers unlimited outdoor recreation. 40 world class golf courses are within an hour's drive. Reno/Tahoe is a home to 18 world-class ski resorts, plus sailing, horseback riding and fishing are also nearby. Majestic Lake Tahoe, historic Virginia City, and the fabled Ponderosa Ranch are only a half-hour away. VISTA ROOM-(opening mid summer) Reno's only roof top restaurant awaits you high atop the hotel tower with breathtaking views of the city of Reno and the surrounding Sierra Nevada Mountains. The gourmet dining experience featuring steak, veal, poultry and seafood specialties are served in an elegant atmosphere featuring table-side service, high ceilings and intimate dining. Reservations recommended. BENIHANA- The world-famous Japanese steakhouse. The only show in town where you can eat the props. Open for dinner nightly. GOLDEN PALACE CHINESE RESTAURANT AND BAR- Truly a trip into authentic Oriental Cuisine. Open for lunch and dinner. The Terrace COFFEE SHOP- Offering everything from eggs Benedict to delicious salads and gourmet sandwiches! Serving breakfast, lunch and dinner any time.